Dark caramel colouring. Pretty carbonated pour out of the bottle. Head don’t last long. Usual malty hoppy nose, but nice burnt sweetness. Tastes a little like a Creme caramel beer. Is pleasant and at 3.6% it’s not going to knock your head off. 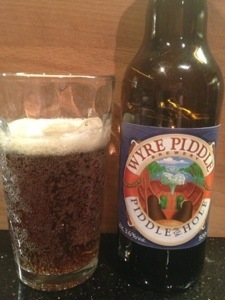 This entry was posted in beers and tagged hole, piddle, wyre. Bookmark the permalink.